In 1731, Spanish coast guardsmen boarded an English merchant ship captained by Robert Jenkins. The Spaniards accused the Englishmen of smuggling, and as punishment cut off Jenkins’ ear. According to some accounts, Jenkins later exhibited the severed ear in front of the British Parliament during his testimony on Spanish depredations. This incident, along with numerous petitions and lengthy testimony, convinced the British government to take action against Spain. War erupted across the Caribbean soon after the hearings before Parliament. The most significant action in Florida resulted from an expedition led by General James Oglethorpe against the city of St. Augustine in the summer of 1740. By all accounts, Oglethorpe’s campaign constituted an epic failure. The General Assembly of South Carolina launched a full investigation into the failed siege. Ultimately, they concluded that a series of tactical mistakes doomed the English effort to weaken the Spanish outpost. 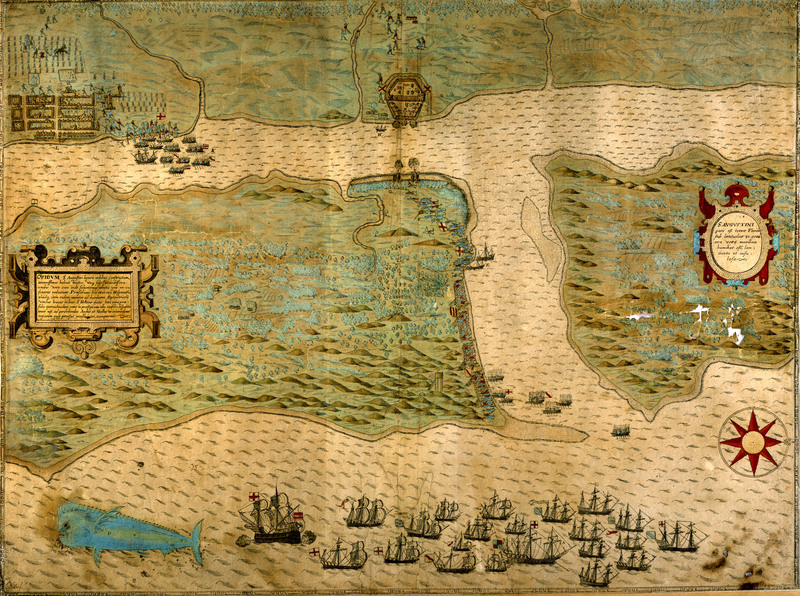 English cartographer Thomas Silver created the map below to illustrate the siege against St. Augustine. It bears a striking resemblance to a map depicting an earlier British attempt to level St. Augustine, undertaken by Sir Francis Drake in 1586. The transcription of the long key included with the map has, as much as possible, preserved spellings used in the original. An early, hand-colored engraving of Silver’s map resides in the Florida Map Collection at the State Library of Florida. “A View of the Town and Castle of St. Augustine, and the English Camp before it June 20, 1740. By Thos. Silver. Forces of the Spaniards 1000 besides a Strong Castle and 4 Fortified Barks and a Shallow River hindring our Shippings Playing on them. An Account of the Siege of St. Augustine in the letter on Board ye Hector. May 30 we arrived near St. Augustine, June 1st we were join’d by the Flamborough. Capt. Pearse, the Phoenix Capt. Fanshaw, the Tartar Capt. Towshend and the Squirrel Capt. Warren of 20 Guns each besides the Spense Sloop Capt Laws, and the Wolf Capt. Dandrige. On the 2d Col Vander Dufen with 300 Carolina Soldiers appear’d on the North of the Town. On the 9th Genl. Oglethorpe came by Sea with 300 Soldiers and 300 Indians from Georgia. On the 10th they were carried a Shore in the Men of Wars boats under the cover of the small Ships Guns. They Landed on the Island Eustatia without Opposition and took the Look-out at G.
The 13th Capt. Warren in a Schooner and other Armed Sloops and Pettyaugers anchored in their Harbor just out of Cannon shot till the 26th when the Sailors were employed in landing Ordnance and other Stores within Reach of the Enemys Cannon. On which Occasion they discover’d a surprising Spirit and Intrepidity. The same night two Batteries were rais’d, but too far off. The 27th the General Summon’d the Governor to Surrender, who sent word he should be glad to shake hands with him in his Castle. This haughty answer was occasioned by a dear bought Victory, which 500 Spaniards had obtained over 80 Highlanders 50 of whom were slain, but died like Heroes killing thrice their number. Stay tuned for “The British Invasion (Part Two),” which recounts the Spanish-African-Native American victory over Oglethorpe’s troops at the Battle of Bloody Mose. To learn more about the British siege of St. Augustine in 1740, see Edward Kimber, A Relation, Or Journal, Of a Late Expedition &c (Gainesville: University Presses of Florida, 1976); John Tate Lanning, ed. The St. Augustine Expedition of 1740: A Report to the South Carolina General Assembly (Columbia: South Carolina Archives Department, 1954); Aileen Moore Topping, ed. An Impartial Account of the Late Expedition Against St. Augustine under General Oglethorpe (Gainesville: University Presses of Florida, 1978). On May 21, 1722, Jesuit explorer and historian Pierre François Xavier de Charlevoix visited Fuerte San Marcos de Apalache on Florida’s northern Gulf coast. Author of Histoire et description générale de la Nouvelle France avec le journal historique d’un voyage fait par ordre du roi dans l’Amérique septentrionnale (1744) and many other works, Charlevoix was among the first French historians of New France. Charlevoix described his approach to the remote Spanish outpost: “About ten o’clock we perceived a small stone-fort, of a square form, with regular bastions; we immediately hung out the white-flag, and immediately after were told in French to proceed no farther.” After a few tense moments, the soldiers allowed Charlevoix and his captain to “speak with the governor: we went, and were very well received.” The defenders of Fuerte San Marcos de Apalache had reason to worry, as French pirates were known to frequent the region in the 17th and 18th centuries. Between 1702 and 1709, English colonists from Carolina and their Creek Indian allies destroyed numerous Spanish and Native American settlements in La Florida. Ethnohistorian John Hann analyzed several inconsistencies in the remaining versions of Moore’s account and concluded that we cannot be certain about which settlements were razed, the number captives taken, or the causalities suffered by the Apalachee. Regardless of the exact facts and figures, historians agree that Moore’s raids had disastrous consequences for the Apalachee. As a result of the English and Creek expeditions, the vast majority of the Apalachee were expelled from their homeland. Many were sold into slavery, or absorbed by the Creeks. Some refugees fled to Louisiana, where their descendants remain today. A small number reached St. Augustine and accompanied the Spanish to Cuba in 1763, never to return to Florida again. For further reading, see Mark F. Boyd and Hale G. Smith, Here They Once Stood: The Tragic End of the Apalachee Missions (Gainesville: University Press of Florida, 1951); Allan Gallay, The Indian Slave Trade: The Rise of the English Empire in the American South (New Haven: Yale University Press, 2003); John H. Hann, Apalachee: The Land between the Rivers (Gainesville: University Presses of Florida, 1988). On April 14 or 15, 1528, Spanish explorer Pánfilo de Narváez landed near Tampa Bay. Map of the West Indies that includes Florida. Published by Theodor de Bry, 1594. His expedition split into two groups. One stayed with the ships and hugged the coast, the other traveled inland towards modern-day Tallahassee. The men at sea failed to reestablish contact with those inland and were presumed lost. Battered by hurricanes and attacked by local Timucua and Apalachee Indians, Narváez’s men built boats, possibly near the St. Marks River, and attempted to flee Florida. After eight years, only four survivors made in back to Mexico. One of the survivors, Álvar Núñez Cabeza de Vaca, wrote an account of his experience titled Naufragios y Comentarios. Join in the VIVA Florida 500 commemoration, April 4-6, 2013, at the R.A. Gray Building in downtown Tallahassee. Go behind the scenes at the Bureau of Archaeological Research Conservation Lab, view three rarely displayed documents from the State Archives, and take a guided tour of the Museum of Florida History’s new permanent exhibit Forever Changed: La Florida, 1513-1821. 10 a.m., 1 p.m., and 3 p.m.
11 a.m., 2 p.m., and 4 p.m. The R. A. Gray Building is located two blocks west of the Capitol Building on Bronough Street, between the Civic Center and the Supreme Court of Florida: 500 South Bronough Street, Tallahassee, Florida 32399, 850.245.4400.